Naples is the capital of the Italian region Campania and the third-largest municipality in Italy after Rome and Milan. Your inner history buff will appreciate Herculaneum Parking and Castello Aragonese. Appreciate the collections at National Archaeological Museum of Naples and Capodimonte Museum. Explore the numerous day-trip ideas around Naples: The Royal Palace at Caserta (in Caserta) and Castello Aragonese (in Ischia). There's still lots to do: get engrossed in the history at Galleria Borbonica, get impressive views of Mount Vesuvius, explore the historical opulence of Castel dell'Ovo, and stroll the grounds of Catacombe di San Gennaro. To get photos, ratings, reviews and more tourist information, read Naples travel guide. Use the Route module to find suitable travel options from Bangkok, Thailand to Naples. Due to the time zone difference, you'll gain 6 hours traveling from Bangkok to Naples. Prepare for a bit cooler weather when traveling from Bangkok in July: high temperatures in Naples hover around 35°C, and lows around 24°C. Finish up your sightseeing early on the 3rd (Wed) so you can catch the taxi to Pompeii. Kick off your visit on the 4th (Thu): explore the ancient world of House of the Faun (Casa del Fauno), contemplate the long history of Gli Scavi Archeologici di Pompei, then contemplate the long history of Villa dei Misteri, and finally admire all the interesting features of Forum at Pompeii. For reviews, traveler tips, other places to visit and tourist information, read our Pompeii travel guide. Pompeii is just a short distance from Naples. Expect a daytime high around 36°C in Pompeii in August, and nighttime lows around 26°C. Finish your sightseeing early on 4th (Thu) to allow enough time to drive to Salerno. Start off your visit on the 5th (Fri): explore the ancient world of Il Tempio di Nettuno o Poseidone o di Hera II, see the interesting displays at Archaeological Museum of Paestum, and then delve into the distant past at Paestum Ruins. Get ready for a full day of sightseeing on the 6th (Sat): take in nature's colorful creations at Giardino della Minerva, then kick back and relax at Spiaggia Lannio, then learn about winemaking at Le Vigne di Raito, and finally take in the architecture and atmosphere at Duomo di Salerno. To see reviews, traveler tips and tourist information, read Salerno travel guide. Salerno is just a short distance from Pompeii. Expect a daytime high around 34°C in Salerno in August, and nighttime lows around 28°C. Cap off your sightseeing on the 6th (Sat) early enough to catch the taxi to Ravello. Ravello is a town and comune situated above the Amalfi Coast in the province of Salerno, Campania, southern Italy, with approximately 2,500 inhabitants. Your inner history buff will appreciate Villa Cimbrone Gardens and Villa Rufolo. Step out of Ravello to go to Agerola and see Sentiero degli dei (Path of the Gods), which is approximately 44 minutes away. There's lots more to do - contemplate in the serene atmosphere at Duomo di Sant'Andrea Apostolo, add some adventure to your tour with a kayaking and canoeing tour, enjoy the sand and surf at Lido Capo di Conca, and indulge your senses at some of the top wineries in the area. To get more things to do, traveler tips, photos and tourist information, read Ravello travel guide. Ravello is very close to Salerno. In August, plan for daily highs in Ravello up to 34°C, and evening lows to 28°C. Wrap up your sightseeing on the 9th (Tue) to allow time to drive to Positano. Start off your visit on the 10th (Wed): indulge in some culinary diversions at a local gastronomic tour, indulge your taste buds at Swirl The Glass, and then tour the pleasant surroundings at Spiaggia del Fornillo. Here are some ideas for day two: your second day here, stop by Ceramica Assunta, kick back and relax at Bagni d'Arienzo, and then paddle through the water with a kayaking and canoeing tour. For photos, ratings and tourist information, you can read our Positano travel guide. 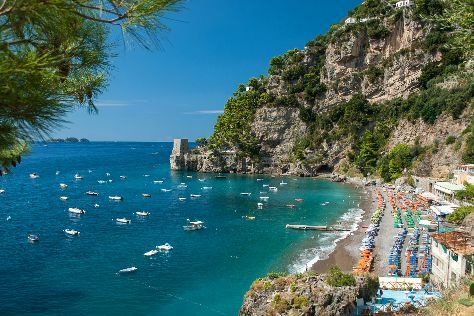 Positano is just a short distance from Ravello. While traveling from Ravello, expect somewhat warmer days and about the same nights in Positano, ranging from highs of 38°C to lows of 27°C. Wrap up your sightseeing on the 11th (Thu) to allow time to drive to Sorrento. Cattedrale di Sorrento and Marina di Puolo will appeal to history buffs. There's still lots to do: look for gifts at Corner Shop, take in the waterfront at Marina Grande - Antico Borgo Marinaro, kick back and relax at Stabilimento Balneare Bagni Salvatore, and stroll through La Solara. For photos, where to stay, traveler tips and other tourist information, go to Sorrento travel guide. Sorrento is very close to Positano. Expect a daytime high around 38°C in Sorrento in August, and nighttime lows around 27°C. Finish your sightseeing early on 14th (Sun) so you can travel back home.